Are your house plants looking a little peaked after a long winter of being cooped-up inside? Getting out for some fresh air during the warm months is healthy for all living things, including your potted plants. It is important to move plants safely and thoughtfully, however, or else you risk shock and damage that can destroy your carefully cultivated houseplants. With the right steps, you can move your houseplants to outdoor accommodations for the spring and summer while still protecting them from unfavorable conditions, pests and wildlife. Wait until there is no longer any danger of freezing or frost before setting houseplants outside. Before you place plants outdoors, acclimate them to the spring temperatures. Set them outside for short periods of time and bring them inside at night. Over a period of two weeks, lengthen the plants’ outdoor exposure time gradually. Continue to bring plants inside at night if temperatures are not consistently above 55 degrees Fahrenheit. Do not place plants directly in the sun or else the leaves may burn. Set plants on pot feet or a suitable plant stand to prevent sow bugs. Arrange plants in groups for increased humidity, being careful to promote good air circulation within the foliage. Check soil often for moisture levels, as warmer days and breezes may dry pots out more quickly. Empty saucers of excess water to prevent root rot and minimize standing water that will attract biting insects. While away on vacation, use a self-regulating plant watering system. Mulch the surface of the soil to retain moisture and keep weed seeds from invading the soil. Keep squirrels from digging in pots by placing a layer of crushed oyster shells or chicken wire on top of the soil. Use a slow-release fertilizer to save you time and energy on frequent fertilizing. Or, use a water soluble fertilizer every other week. Follow the manufacturer’s instructions so as not to burn tender plant roots. Groom plants by clipping off damaged stems, yellow leaves and spent flowers. This will also improve air circulation and sunlight reach. Trellis or stake plants that get too tall to prevent them from flopping over. 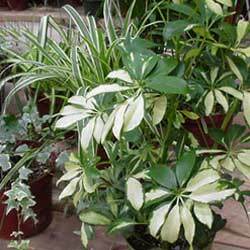 As they enjoy their time outdoors, you’ll see healthier, more robust houseplants with plentiful new growth and vigor. Why not give all your plants a great spring and summer getaway by moving them outdoors?